Meri Te Tai Mangakāhia and Mary Ann Colclough both addressed the question of “what women want” and their pioneering efforts to win equal rights for New Zealand women are represented by two objects acquired by the Museum. 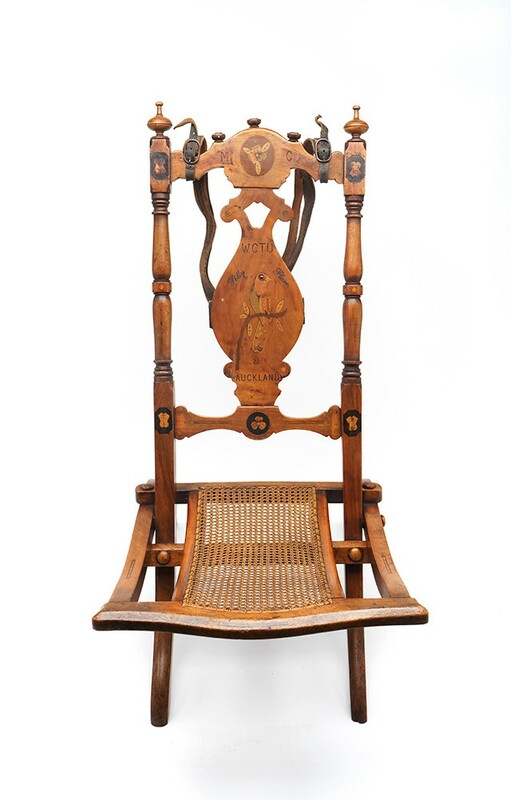 Meri’s parliamentary chest and Mary Ann’s chair were bought at the 2006 auction of the Charles Wakefield collection held in the UK. Charles Wakefield was the founder of the Wakefield Oil Co. which later became Castrol Oil. Image header: Folding chair dedicated to MC "Polly Plum" and WCTU, Auckland - detail [2006.98.2]. Mason, Frederick W., photographer. [Copy of Portrait of Meri Te Tai Mangakāhia]. Auckland War Memorial Museum Tamaki Paenga Hira. PH-NEG-C5101. Meri Te Tai Mangakāhia (1868–1920) is recorded as the first woman to speak in any New Zealand parliament. In 1892, when her husband Hāmiora had been elected premier of Te Kotahitanga, the Māori parliament, Meri attended the session at Waipatu in the Hawke’s Bay. The speaker of the lower house introduced a motion from Meri requesting that Māori women be given the right to participate in the selection of members. Meri was invited to come into the parliament to explain her motion. She not only requested that Māori women be given the right to vote but that they also be eligible to sit as members of parliament. Meri’s parliamentary chest reflects her personal and political alliances. The chest was made for Hāmiora and Meri and the beautiful box depicts, both inside and out, their Whangapoua homestead. The lid carries their names and the words "Votes for Women" together with the initials WCTU, which stands for Women’s Christian Temperance Union. 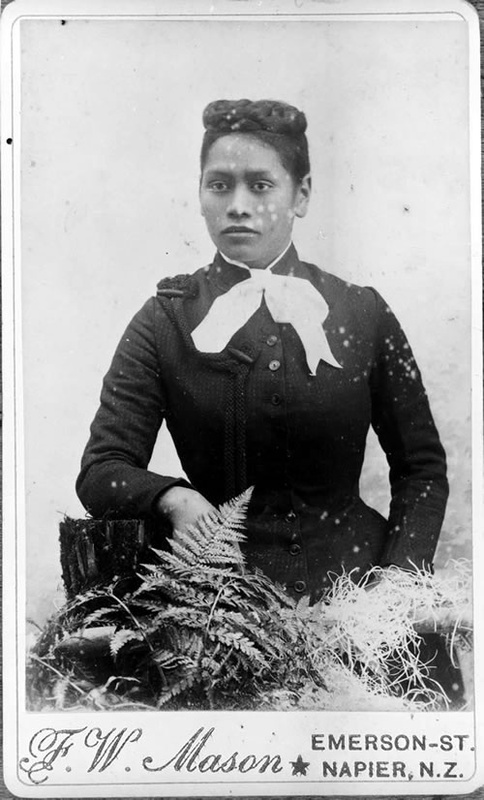 Meri is believed to have been born in 1868 at Waihou-nui-a-rua in the Hokianga district. She was the daughter of the influential Te Rarawa chief Te Tai and his wife Hana Tera. Meri was educated at St Mary's Convent in Auckland where she became an accomplished pianist. Image (right): New Zealand Women's Temperance Union Kotahitanga parliamentary chest. Collection of Auckland Museum Tamaki Paenga Hira, 2006.98.1. Cultural permissions apply. Around the early 1890s, Meri married Hāmiora Mangakāhia of Ngāti Whanaunga from the Coromandel. He was a Native Land Court Assessor and had been working in the Bay of Islands at the time. They built themselves a homestead on Hāmiora’s land at Whangapoua on the Coromandel Peninsula. The host of the meeting at Waipatu in 1892 was Henare Tōmoana. Ākenehi Tōmoana, his wife, supported Meri’s motion to the parliament and was also known for speaking forthrightly about Māori women’s rights to maintain and control ownership of their land. The very fine, inlaid parliamentary chest was ordered for Hāmiora and Meri by Henare and Ākenehi. 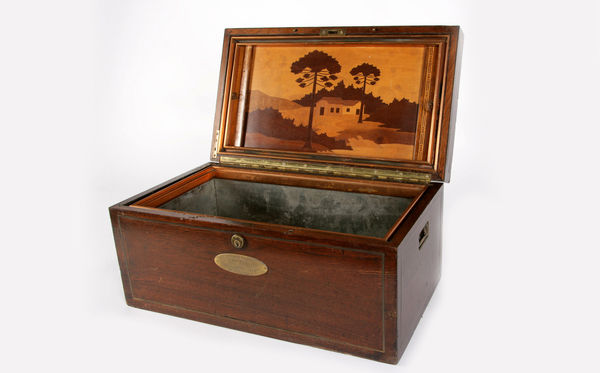 The inlay work uses native woods and is a very fine and important example of 19th-century New Zealand cabinet making by Andrew & Sons, from Wellington. After Meri’s death the box came into the possession of Alethea Constance Cherry, a member of the Queensland Cherry family. Connie had been given the box by friends in Australia and a further inscription on the box reads "To Connie Cherry, Farewell 20th January 1927 Caranderrk Station, Healesville". Meri’s legacy truly stands the test of time. Her brave and unabashed address to Te Kotahitangi on a woman’s right to vote was an important contribution in the fight for New Zealand women to have equal political footing with men. 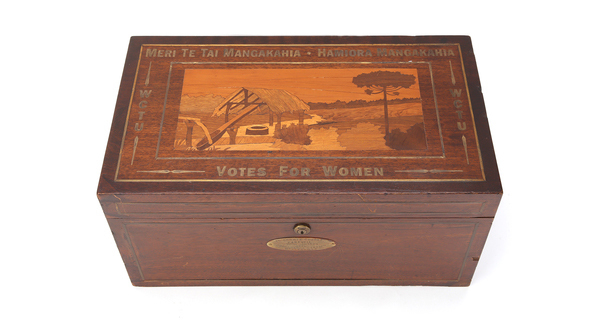 Image (right): New Zealand Women's Temperance Union Kotahitanga parliamentary chest. Inlaid view of Whangapoua homestead. Collection of Auckland Museum Tamaki Paenga Hira, 2006.98.1. Cultural permissions apply. 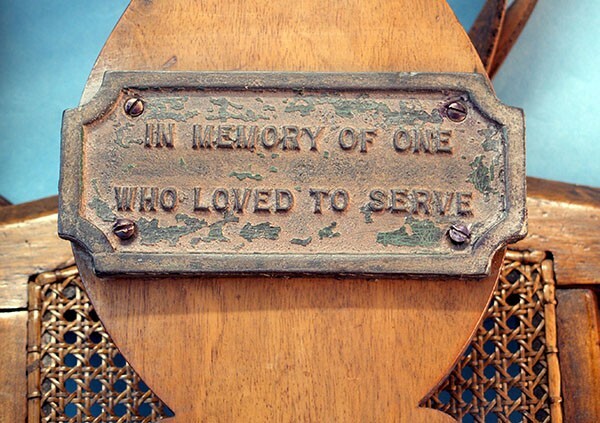 "In Memory of One Who Loved to Serve" is the inscription on a chair dedicated to Mary Ann alias “Polly Plum”. Mary Ann was at the vanguard of the women’s rights movement in New Zealand from the 1870s, and the words recognise her campaign for equality. Born in London in 1836, Mary Ann Barnes trained as a teacher before coming to New Zealand in 1859. She settled in Auckland and in 1861 married Thomas Caesar Colclough. Following his death in 1867, and with two young children to care for, Mary Ann resumed teaching. She also became a champion of women’s rights and, in particular, targeted property rights for married women. From 1871 to 1873 Mary Ann campaigned vigorously, delivering public lectures in Auckland and the Waikato. Under the pseudonym Polly Plum, she contributed articles to a number of newspapers. "The right, as thinking, reasoning beings, to decide for themselves what is best for their own happiness. If they were satisfied with man’s decision, this agitation for change would not be." "Iniquitous that in a Christian country, anyone, male or female, should have it in their power to wrong and oppress others, under the shelter of the law." Large audiences attended Mary Ann’s lectures on the subject of women’s rights which covered the topics of owning property (within marriage), voting, working, and education. She also advocated temperance and improved treatment of women prisoners and prostitutes. At a time when it was unusual for women to deliver public lectures she attracted great numbers – boats were laid on from the North Shore for her second Auckland lecture. She also had the support of a number of leading clergymen, and her departure from Auckland to take up a teaching post in Tuakau was marked by a public farewell. "The majority of women are unfit even to have authority over their children still less over their domestic servants. To make them legally equal to their husbands would be disastrous in the extreme … Women’s power is her weakness, her tenderness, and her ability to love deeply." In 1874 Mary Ann crossed the Tasman to Australia where she continued her support for women’s causes. This included advocating for athletic sports for girls, the removal of the vow of obedience from the marriage service, and public discussions about prostitution. Mary Ann returned to New Zealand in 1876 and continued teaching, at Rangiora and Papanui. She witnessed the passing of the Married Women’s Property Act in 1884 but unfortunately did not live to see New Zealand women receive the vote, as she died in 1885 aged 49 following a serious accident. The chair dedicated to Mary Colclough also acknowledges the Women’s Christian Temperance Union (WCTU) founded in the USA in 1874. The first branch of the WCTU in New Zealand was established in Auckland in 1885. The ongoing battle for women’s right to vote was largely spearheaded through the WCTU. As far as women's rights go, both Meri and Mary truly led the way for feminist activism, championing equality and female liberation. Today's activists represent a multicultural dynamic, broadcasting their ideas and beliefs across gender and race barriers, ultimately hoping to create a more united and accepting world by which everyone's rights are not only welcomed, but mandatory. Originally published in MQ: Museum Quarterly, The Quaterly Magazine of Auckland War Memorial Museum, Issue 111, Winter: June-August 2007, pp.14-15, What Women Want written by Chanel Clarke and Rose Young. Clarke, Chanel. "Meri's parliamentary chest and Mary Ann's chair", Auckland War Memorial Museum - Tāmaki Paenga Hira, Published: 14 11 2018.